The ENCALS Young investigator award 2015 has been awarded to Edor Kabashi. 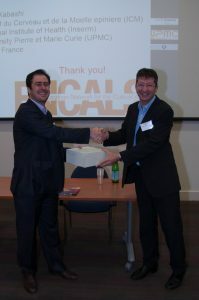 The chair of the prize committee, Prof. Ammar Al Chalabi, congratulated Kabashi at the final day of a successful ENCALS meeting in Dublin. 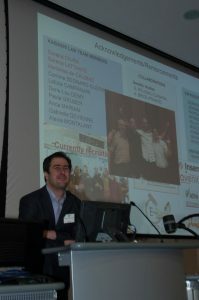 Edor Kabashi has continuously dedicated his research to ALS. He worked as a postdoctoral researcher at the Centre of Excellence in Neuromics at University of Montreal, Canada. In 2011 he joined the ICM Brain and Spine institute in Paris, where is leader of the team “ALS: From Genetics to Treatment”. His team is aiming to identify novel genetic causes in ALS and to develop mutant transgenic zebrafish models for these genes to study neurodegenerative processes. This approach also allows the team to use these genetic models for multigenic interactions and drug discovery. Kabashi’s team has developed innovative screening protocols to identify neuroprotective compounds, to understand molecular mechanisms modulated by these compounds and to advance therapy development in neurological diseases. The ENCALS young investigator award was designed to recognise the brightest and best young scientists in ALS, and is given for outstanding research. 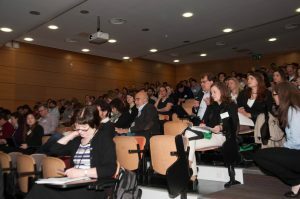 It is judged by the ENCALS prize committee, an international panel of experts, on any or all of novelty, clinical impact, and challenge to existing ideas about ALS, as well as the strength of publications and grants. Earlier recipients of the ENCALS young investigator award were Dr. Jan Veldink from University Medical Centre Utrecht, the Netherlands 2011, Dr Martin Turner of Oxford University, UK 2012, Dr Luc Dupuis from the University of Strasbourg in France 2013 and Dr Ashley Jones from Kings College London, 2014. All of these high profile researchers are continuously dedicated to ALS research and strenghten the ENCALS network with their involvement in international research collaboration. The team of Kabashi has been involved in the identification of a number of major genes in ALS, including the initial discovery of TDP-43 mutations (Kabashi et al. 2008 Nature Genetics). In collaboration with a French team of clinicians and geneticists, we continue to screen for novel genetic mutations in ALS patients (Lattante et al. Neurology 2014; Neurobio Aging 2013, 2014) to define the pattern of genetic inheritance for this major neurodegenerative disorder (Lattante et al. Trends in Genet in press). To functionally characterize these common mutations recently identified in ALS patients, Kabashi developed zebrafish models of disease, being able to recapitulate a number of pathological features of ALS, including protein aggregation, motor deficits and anomalies in axonal projections from motor neurons. His team has led the field by developing zebrafish models for a numberof ALS genetic factors, including TDP-43, FUS, SOD1, ALS2 and VAPB (Kabashiet al. HMG 2010; PLoS Genet 2011; HMG 2013). Major cellular pathways implicated in disease can thus be studied in a vertebrate model that lends itself to in vivo imaging, multigenic manipulations and automated behavioural screening. To discover pharmacological targets that display neuroprotective properties in zebrafish genetic models, a semi-automated chemical screening assay was developed in the laboratory and we have identified several bioactive compounds that reduce neurodegeneration in mutant TDP-43 and FUS transgenic lines (Vaccaro et al. Neurobio Dis 2013; Lattante et al HMG 2015).Furthermore, the Kabashi team has used these zebrafish models to performepistatic analyses in order to understand prevalent genetic interactions, includingmutant TDP-43 functional interaction with FUS (Kabashi et al. PLoS Genet2011). The Kabashi team has also recently described that the most common genetic cause in ALS, hexanucleotide repeat expansions of the C9orf72 gene, are associated with reduced expression of this gene in ALS patient tissue. To functionally characterize this genetic anomaly, they knocked down C9orf72 expression in zebrafish and observed major abnormalities in the axonal projections from motor neurons and deficits in spontaneous and evoked swimming (Ciura et al. Ann Neurol 2013). Similarly, Kabashi et al. have described that knockdown in zebrafish of a novel gene in ALS, SQSTM1, yields similar motor deficits and have demonstrated that chemical induction of autophagy leads to significant reductionof motor neuron degenerative processes (Lattante et al. 2015 HMG). These innovative vertebrate models are allowing the researchers to identify shared pathogenic mechanisms in motor neuron diseases with the great potential to identify in the near future therapeutic strategies to halt neurodegenerative processes in order to properly treat ALS.